A highly anticipated addition to Prairie Street Brewhouse, 200 Prairie St., Rockford, has arrived. 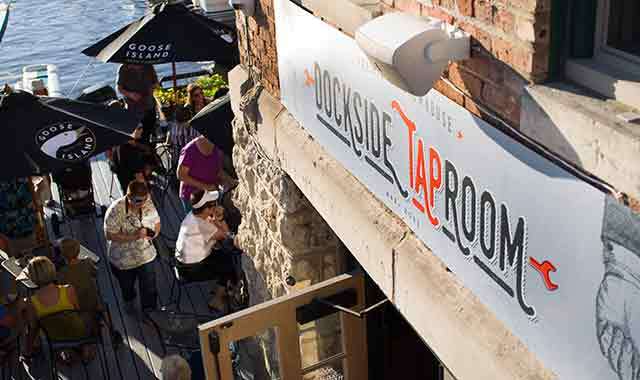 The Rockford Brewing Co. restaurant now has a new sports bar called Dockside Taproom that serves lunch and dinner seven days a week. The cool, casual bar with 24 taps is located right next to the restaurant’s arcade area, and is also just steps away from the restaurant’s riverside dock, making this new hangout a relaxing place for people to unwind, indoors or out. Opening a sports bar was something Manuel always wanted to do with his co-founders, Reed Sjostrom and Dustin Koch, but Manuel credits the Koch family for coming up with the idea. Manuel is happy to say that the sports bar carries the restaurant’s full lunch and dinner menus with only some entrée items lacking, so people can snack while they watch a game or dine as they catch up with friends. The well-rounded menu ranges from burgers, sandwiches and tacos to wings, pizza and desserts. True to its name, the restaurant also brews its own beer right on site. He especially recommends the Black and Blue Kolsch, a refreshing beverage infused with blackberries and blueberries. In addition to the new sports bar, Manuel is excited about the restaurant’s weekly Dinner on the Dock event Thursday nights from 5-10 p.m. Roughly a thousand people come each week to enjoy a buffet-style meal, live music and the river. Dinner on the Dock has a new stage for live entertainment. Family-friendly bands of all genres come from Chicago, Madison and even the local area to start the weekend out a little early, Manuel says. He always wanted to provide this type of event to the people of Rockford. Looking forward, the restaurant plans to start its own line of pickles and bring back the man-made raft race that used to occur here every July 4. “The best part of my job is coming up with ways where we can have more fun,” Manuel says with a laugh. He appreciates how open the people of Rockford have been to the Brewhouse’s downtown presence. Prairie Street Brewhouse is open Sun.-Wed. from 11 a.m. to 10 p.m.; Thu. to midnight; and Fri. and Sat. to 2 a.m. For more information, or to make a reservation, call (815) 227-9427. This entry was posted on Thursday, August 27th, 2015 at 12:00 pm	and is filed under Dining Guide, Top Posts. You can follow any responses to this entry through the RSS 2.0 feed. Both comments and pings are currently closed.